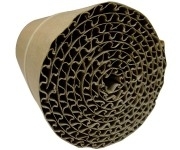 Corrugated Cardboard wrap with 99+ nesting spaces for the smaller Leafcutter Bees, which are active during the summer. You can put these inside a handmade bee house or into one of our houses, and the summer bees will nest in it! The corrugated cardboard is a one-time use, so they will only work for one season.